Harare lawyer Joshua Chirambwe has filed a Constitutional Court (Con-Court) application seeking the nullification of the appointment of Kumbirai Hodzi as the substantive Prosecutor General (PG). The application comes barely a fortnight after another Harare man made a similar request. According to both men’s lawyer Thabani Mpofu, the two applications remain extant before the court. In the applications, President Emmerson Mnangagwa, the Judicial Services Commission (JSC), Chief Justice Luke Malaba, Justice minister Ziyambi Ziyambi and Hodzi, are cited as respondents. A fortnight ago, Simbarashe Zuze’s application was struck off the roll after being deemed abandoned. Mpofu insists, Zuze is still pursuing his application. 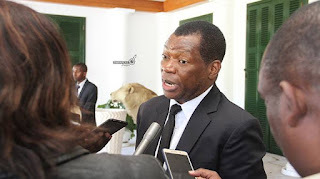 Along with Chirambwe, the pair argued in court papers that Hodzi is not fit for the job, adding his appointment must be declared null and void. Hodzi was part of prospective candidates that took part in public interviews last year to fill in the position of PG. Before the interviews, he was acting PG, having taken over from Ray Goba in an interim capacity. Goba had resigned after facing a slew of charges. Some of the candidates who participated in last year’s interviews are Calvin Mantsebo, Tinomudaishe Chinyoka, Misheck Hogwe, Jessie Majome, Maphios Cheda, Wendy Rowesai Chingeya, Florence Ziyambi, Edios Edmund Marondedza and Noria Mashumba. Out of the list, Mantsebo, Chinyoka and Hogwe, were the top three respectively. The applicants said it was clear from the public interviews that Hodzi struggled to answer questions from the interviewing panel. “The interviews were conducted in full glare and the fact that fifth respondent (Hodzi) had a torrid time is known to all who cared to follow that process. “To me it was clear that he had shown that he was clearly disqualified from being appointed to the position of Prosecutor-General. “It was there for all to see. The commissioners scored him so badly, at the end of the day he sat at the bottom of the pile. He was clearly and effectively out of the reckoning. “For the good of my country, I celebrated. I felt so good that the Constitution had come up with this transparent process. The president could not, in terms of the Constitution, appoint a person ill-suited for the job simply because he liked him. “I thought we had turned a corner. I legitimately expected that at the end of it all, cream would rise to the top and merit rewarded,” the court was told. The applicants further said Hodzi did not make it to the top six, adding the denial by Mnangagwa of the top three was personal as his preferred candidate dismally failed the interviews. “Fifth respondent (Hodzi) had failed the interview and could not have made that list or any other list that could be produced. But he made it! Such strange happenings have no place in a constitutional set up and must be banished therefrom,” the court was told. The applicants further said that it cannot be ignored that during interviews, Hodzi made it clear that he takes orders from the Executive, which is a threat to prosecutorial independence. However, the JSC last week responded to Zuze’s application, defending Hodzi’s appointment. JSC acting secretary Walter Chikwana said the president has a discretion to choose his preferred candidate. “Section 180 gives the president the discretion to appoint a candidate of his choice to the office of Prosecutor-General. Where, in his discretion, the president considers that none of the persons on the list submitted to him by the JSC are suitable for appointment, Section 180 (5) of the Constitution allows the president to request the JSC to submit a further list of three qualified persons to him from which the president is obliged to appoint one of the nominees on the second list to the office of Prosecutor-General,” he said.